(PD) Image: Dr. Kamil Ugurbil, National Institute of Biomedical Imaging and Bioengineering. This computer-generated image of a human brain shows activation of the primary auditory cortex in response to various sound frequencies. Functional magnetic resonance imaging (usually abbreviated fMRI) is used to observe neural activity in the brain. This neuroimaging technique is based on the principle that neurons require blood to function, and so neural activity can be inferred or indirectly observed by tracking blood flow. FMRI machines produce images, or more accurately - functional images composed of voxels, containing neural activity of the brain based on this concept using magnetic properties of the blood. The signal being measured in an fMRI machine is called the BOLD signal. It has been known since 1890 that the active areas of the brain use more blood than when they are inactive, although it took until 1980 to develop a method of tracking this change. Red blood cells contain hemoglobin, a protein which stores and transports oxygen throughout the body. Active neurons consume oxygen from hemoglobin for energy. Hemoglobin is oxygenated when it is carrying oxygen, and deoxygenated when is depleted. Oxyhemoglobin is paramagnetic, which means it slightly repels a magnetic field, while deoxyhemoglobin is diamagnetic, which means it is slightly magnetic. An fMRI machine is able to detect these changes in magnetic properties, and creates an image based on the blood-oxygen-level-dependent (BOLD) signal. (PD) Image: Dr. Noam Harel, National Institute of Biomedical Imaging and Bioengineering. 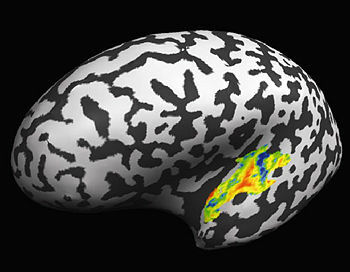 This 3-D fMRI map exhibits blood flow changes in response to visual stimulation. The functional map is overlaid on a high resolution anatomical image. FMRI is primarily used to research the areas of the brain that are specialized for information processing. Studies have confirmed several previously known anatomically distinct areas in the visual cortex, the motor cortex, and language areas. FMRI has been used for preoperative neurosurgery preparation, but is otherwise uncommon in a clinical setting. Some potential clinical applications are presymptomatic diagnosis, drug development, individualized therapy, and an understanding of functional brain disorders. ↑ The f is written in lowercase unless at the beginning of a sentence. ↑ Roy, C. & Sherrington, C. (1890). On the regulation of the blood supply of the brain. Journal of Physiology 11, 85-108. ↑ Ogawa S, Lee TM, Nayak AS, Glynn P (1990). 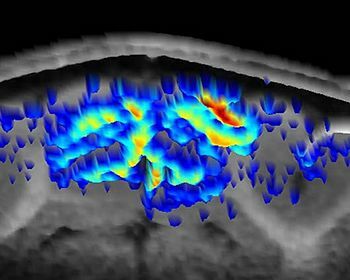 "Oxygenation-sensitive contrast in magnetic resonance image of rodent brain at high magnetic fields". Magn Reson Med 14 (1): 68–78. PMID 2161986. ↑ Belliveau JW, Kennedy DN, McKinstry RC, et al (1991). "Functional mapping of the human visual cortex by magnetic resonance imaging". Science 254 (5032): 716–9. PMID 1948051. ↑ Kim SG, Ashe J, Georgopoulos AP, et al (1993). "Functional imaging of human motor cortex at high magnetic field". J. Neurophysiol. 69 (1): 297–302. PMID 8433133. ↑ Binder JR, Frost JA, Hammeke TA, Cox RW, Rao SM, Prieto T (1997). "Human brain language areas identified by functional magnetic resonance imaging". J. Neurosci. 17 (1): 353–62. PMID 8987760. ↑ Matthews PM, Honey GD, Bullmore ET (2006). "Applications of fMRI in translational medicine and clinical practice". Nat. Rev. Neurosci. 7 (9): 732–44. DOI:10.1038/nrn1929. PMID 16924262. Research Blogging. This page was last modified 14:14, 20 July 2010.